Gudi Padwa 2019, which is also known as Maharashtrian New Year, is around the corner. This special festive marks the beginning of a New Year, which make its very special as the fact people love to purchase new things. And, we often see people purchasing new vehicles on Gudi Padwa. Thus, we do often see several discount offers and deals from dealers. 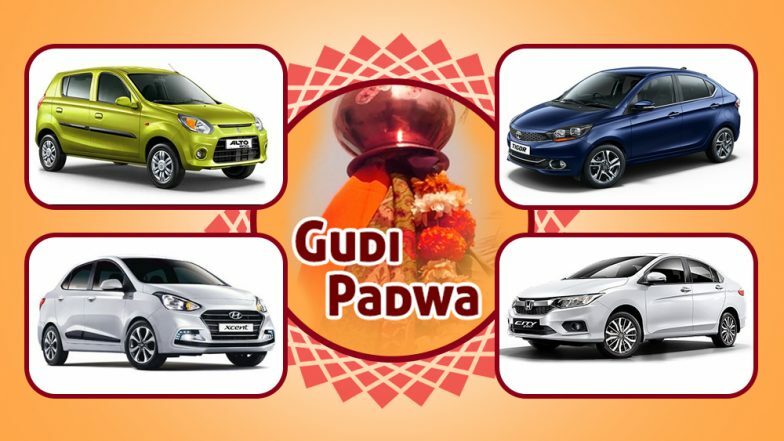 Here are the special discount deals and lucrative offers on cars that you shouldn't miss this Gudi Padwa. Gudi Padwa 2019 Offers on Bikes & Scooters: Get Discounts Up to Rs 7000 on Yamaha R15 V3, Fascino, Honda Activa 5G, Suzuki Gixxer & Other Two-Wheelers. Maruti Ertiga: Maruti Suzuki Ertiga, which is one of the most popular cars from Indo-Japanese car maker is offered with non-resisting deals. As part of the offers, the customers can avail cash discount of Rs 20,000 on both petrol and diesel variants. The customers also stand a chance to avail special benefit under exchange offer up to Rs 45,000 and Rs 30,000 for diesel and petrol respectively, provided that vehicle is less than 7 years old. Maruti Alto: Maruti Suzuki's most affordable cars - Alto 800 and Alto K10 are also available at attractive prices wherein the customers will receive cash discount of Rs 25,000 and Rs 17,000 for Alto 800 and Alto K10 respectively. The vehicles also attract exchange bonus of Rs 25,000 and Rs 30,000 respectively, provided the vehicles are less than 7 years. Tata Tigor: Tata Motor's popular compact sedan - Tigor is up for grab with exciting offers and lucrative deals during Gudi Padwa. Some dealerships are offering first year insurance at just Rs 10,000 along with Exchange Bonus of Rs 10,000. This offer could vary from dealers to dealers. Additionally, the customers looking to purchase Tata Hexa can avail exchange benefit of Rs 10,000 along with first year insurance at just Rs 25,000. Honda City: The mid-sedan from Honda Car India - Honda City can be purchased with exciting offers and attractive deals this Gudi Padwa. Several dealers are offering First Year Honda Assure Insurance on Honda City except VMT variant. Gudi Padwa & Ugadi 2018 Sales and Offers: Is it a Good Time to Shop Online or Buy Real Estate? Toyota Innova Crysta: Toyota's popular MPV also attracts attractive deals during the festive of Gudi Padwa. The customers purchasing new Innova Crysta stand a chance to get accessories worth of Rs 5000 along with low interest finance scheme. Toyota Corolla Altis also brings attractive offers wherein buyers will get Rs 80,000 benefits including Exchange and Corporate Discount. Hyundai Grand i10: Hyundai Grand i10 is offered with lucrative discounts which the buyers will receive cash discount of Rs 35,000 along with Exchange Bonus of Rs 35,000 and Government employee. It is important to note that this discount offers vary from dealers to dealers.